I'm starting to not recognize myself any more. Last year, I read a verse novel about basketball, and it ended up being one of my favorite books of the year. A couple of weeks ago, I picked up this graphic novel about roller derby, and I couldn't put it down. Seriously? Roller derby? Is this really me? I used to be afraid of new genres. I used to shun topics I couldn't relate to. But as I've pushed myself out of my comfort zone, my world has only opened up and become richer. Reading has become even more of a treasure. Astrid and Nicole are best friends and have been since the first grade. But as they approach sixth grade, their interests begin to diverge. Nicole loves to dance; she cares about clothes and the way she looks; she likes boys. Astrid though . . . Astrid doesn't really know what she likes until one night when her mom surprises her with tickets to a roller derby bout. Astrid didn't even know something like this existed, and she is hooked from the minute the emcee announces the names of the Rose City Rollers. She is so excited, in fact, that she doesn't even notice Nicole's lukewarm reaction to all the pushing and shoving and racing and falling. When Astrid sees an advertisement in the program for junior roller derby camp, she assumes they'll both sign up together. But that's not how it goes at all, and Astrid finds herself staring down at six weeks of roller derby camp without her best friend by her side. The roller derby girls are completely different than Astrid is used to. They have crazy nicknames (Slamwich , Scream Soda, and Blondilocks); they dye their hair green and purple; and they're tough as nails. Astrid can barely make it home after the first day because she's so battered and bruised and worn out. But she sticks with it--in part because she never told her mom that Nicole decided to go to dance camp instead, and her mom assumes she's getting a ride home with Nicole every day--and after a couple of weeks, she's hit a certain sort of stride and is excitedly anticipating competing in her first bout. But of course, there are some bumps in the road, and those teach her who she really is and also what it takes to be a good friend. After Roller Girl won a Newbery Honor earlier this year, I was very interested in reading it. You might remember that a graphic novel, El Deafo, won an honor last year as well, and even though I liked it fine, I didn't personally feel like it fit the Newbery criteria. With a second win for a graphic novel this year, I was really interested to see how they compared and if more of a case could be made for this one. And I will say that even though it still seems unfair to strip away the illustrations and consider the text alone because the two are meant to go together, the text itself was far superior to El Deafo. It was sassy and funny and added as much character to the story as the illustrations did. One of my favorite scenes was when Astrid's new friend, Zoey, helps Astrid dye her hair blue. Because Astrid's hair is so dark, they have to dye it blonde first, and when Astrid sees herself, she freaks out. "Okay, relax," Zoey says. "It's OK. Breathe . . . But not too deeply on account of the fumes . . . You're experiencing some shock right now, but this is normal." Although I've never had even the teeniest tiniest desire to play roller derby, I felt like the underlying message of this book (finding yourself, being comfortable with who you are, etc.) was very relatable. I know many twelve-year-olds who would feel a kinship with Astrid, rather than Nicole, and who would appreciate her personality and interests. There is a part of me, however, who wonders how kids who relate to Astrid will react to this book. Will they see it as permission to rebel and be a little more edgy? Astrid and her mom have a couple of fights in the book (the one after her mom finds out that Astrid lied to her and has actually been walking home from camp by herself is especially intense), and those actually demonstrate really great conflict and resolution, so hopefully even kids who relate to Astrid will see how important it is to be honest and communicate with their parents. The other thing that struck me as incredibly real is that Astrid and Nicole don't magically become best friends again. They go through a very rough patch where they basically hate each other, but even though they eventually mend things, their friendship never goes back to the way it was, and you don't get the impression that it ever will. I think that's pretty true to life. Friends often grow apart from each other, and that's okay. One of my major complaints about El Deafo was the ending. I felt like it totally celebrated being dishonest in order to gain popularity. But I had no such problem with Roller Girl's ending. In fact, I wouldn't change a single thing about it. 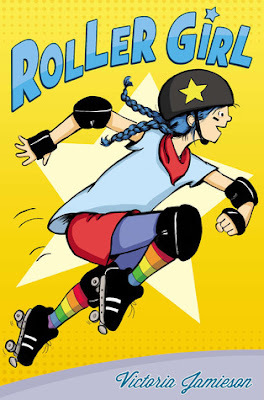 Astrid shows real selflessness and good sportsmanship, but some really great things happen to her as well with her roller derby idol, Rainbow Bite. The most surprising part of the book for me though was just how much I loved reading about roller derby. I thought it was fascinating. Not something that I would ever want to try, mind you, but fascinating. So here's to reading more books about subjects I don't like! Okay, that didn't sound quite the way I meant it to, but you know what I mean. Content note: A mean girl gives Astrid a crude nickname. I loved Roller Derby as well, although I went once to a roller derby match so it wasn't quite as strange to me. Watching was amazing but I had no interest in joining a team :-). What I thought was interesting was that I thought both Astrid and her mom made mistakes. Astrid should have been more honest with her mother, but the mom reacted as though Astrid were defying her and not growing up and needing more autonomy. The book was written through Astrid's POV but I could see both points of view. If my kids rebel from me by sneaking around and EXERCISING than I will be a happy parent (although I will still stress the importance of honesty). I've been surprised this year by the Cybils YA nonfiction titles. My favorite, I WILL ALWAYS WRITE BACK, I opened reluctantly expecting a saccharine story of kids finding they are the same on the inside although different on the outside, and instead was amazed at the growth and compassion shown by both kids. But all of them were great reads, which is not something I expect when reading nonfiction aimed at youth. You're totally right about Astrid and her mom, which is why I think this book felt so relatable. And because of that, I think it appeals to more than just the 4th-6th grade crowd. I'm going to have to go back and take a second look at the Cybils nonfiction titles. I Will Always Write Back sounds amazing.